Everyone of us goes through a hard time, the time which make us confused, which seal our lips, make us to think, again think and then re-think. At that time, on that particular moment we feel that nothing is going the way we want, even the god is showing no mercy to us. Now coming to the point which i want to highlight, why we do so? Why we go always with a negative approach, everytime we find ourself passing through such phase of life? Why we end up with loosing all the faith which we once used to have in the god? Why we leave all our hope, all our confidence? Okay so here i leave you with this one simple question, which i think you should answer before moving to a conclusion about your life, the way you live, the way you get fed from it.. Many of us always think that as an individual what the hell we can do to clean up the mess from the politics?. So if you are one of the same then remove your hand from the cursor and just read on this post patiently because here i’m going to share an exclusive information with all of you. So “Listen-Listen-Listen” have you heard of “Negative Voting”?. Yeap that one which provide us right to De-Elect a canditate?. Yes if we have the right to elect the government, then don’t you think that we should also have the right to De-Elect it?. Afterall we live in democracy where the government is by the people, for the people, of the people. All of you might say that yes we should have this right also, but my friends please get awaked because this concept will only get enforced if you fight for it. Wondering that what you can do? It’s simple, you have to just sign a petition drafted by People’s Union for Civil Liberties(PUCL) before the supreme court seeking implementation of the proposed reforms of ECI. Hmm.mm but some of you might say that if this petition had already drafted then what’s the need to sign it now?. So my friends i may add upto your knowledge that this petition is now got oppposed by the government. The Govt. has argued that unlike freedom of speech and expression, voting is just a statutory right. Govt. even goes on to say that such an option is not healthy for democracy(source). So now the only way left is to come together. Let’s sign this petition because more the number of people sign this petition, more will be the chances of this concept to get enforced. And who know may we get to see an extra option in the this year Electronic Voting Machines(EVM) for negative voting. Move For Change>>Click & Sign. Yes now Delhi Metro, the unique one in itself has given a new year present in the form of a helpline no:”128128“. Through this no. assistance can be demanded by any physically or visually challenged people on any of the Metro Station. But my friends the point is that how a visually challenged person will call on this no.? Anyway i think still we should appreciate this initiative taken up the DMRC.After all yaar they are not enacting like the government, which is still not able to find out a solution for the Killer Bluelines. Is This The Real Picture Of Indian Politics? This Is The Real Picture Of Indian Politics. A Great Story I received today by mail & would like to share this wonderful story with you all. Opposition MPs stage a walkout. Left parties call for ‘Bengal Bandh’ in West Bengal and Kerala demanding a Judicial Enquiry. CPM in Kerala immediately passes a law preventing Ants from working hard in the heat so as to bring about equality of poverty among Ants and Grasshoppers. Finally, the Judicial Committee drafts the ‘ Prevention of Terrorism Against Grasshoppers Act’ [POTAGA], with effect from the beginning of the winter. Arjun Singh makes ‘Special Reservation ‘ for Grasshoppers in Educational Institutions & in Government Services. The Ant is fined for failing to comply with POTAGA and having nothing left to pay his retroactive taxes; its home is confiscated by the Government and handed over to the Grasshopper in a ceremony covered by NDTV. The Ant Has Since Migrated to The US and set up a multi billion dollar company. India Is Still A Developing Country. So isn’t the exact story of Indian Politics? It Happens Only In India? Another Survey reports have recently striked the Breaking News. Once more time it has been proved that it’s Indians who never shame while taking bribe. Once again it has been brought in the front of people that it’s CORRUPTION which is the, “Ultimate Challenge to the mankind”. Thinking of what such has happened?……….So I may inform all of you that it’s Transparency International India and the Centre for Media Studies whose Survey results has rocked again the entire nation. Do You Too Belong To One Of The Most Corrupted States? The state-by-state survey by Transparency International India, places four Indian states in its “Alarmingly Corrupt” category. And these four states are – Jammu and Kashmir, Bihar, Madhya Pradesh and Uttar Pradesh…So do you belong too any one of these? Next come Category of “Very Highly Corrupt” states that includes Karnataka, Rajasthan as well as Tamil Nadu. WHICH STATES ARE THEN BEST ONE’S? Yeah it’s Andhra Pradesh, Haryana, Himachal Pradesh, Maharashtra, Punjab, Uttarakhand and West Bengal which are the “Moderately Corrupt” states of India. Well-done…J. WHICH SECTOR IS THE MOST CORRUPTED ONE? I think that most of you must have spotted it…Yeah it’s someone who is always with you…. 24×7…J,”The Police Department”. In all these states Police department tops the corruption chart followed by others including the Forest Department, Land Records/Registration and Housing. While the Electricity, banking, education, water supply and the National Rural Employment Guarantee Scheme fell under the other corrupt services. Post a Comment on it>>Tell how much do you think India is corrupt? Is there any way to remove this corruption?? & hurts even more when you keep on thinking about her all the day time. It hurts when you feel Urself totally alone. It hurts when there is no one with whom you can chat anymore. So what you achieve from all this game…? 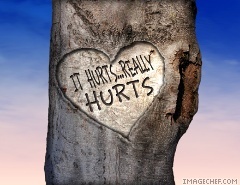 Because it hurts at least once in your life…the time when you really fall in love for a while…. What at most an individual can do…what at most he/she can achieve…how he/she can challenge his own destiny….. all these things have been shown off by various individual’s during the Beijing Olympics’08.If on one hand Michael Phelps has achieved a record of 8 gold medals in single Olympic…& if Jamaica’s Usain Bolt has became the 1st sprinter to win the Olympics gold medals with 2 world records than on other part India had also not remained too behind …….yes Sushil Kumar, Vijender Kumar & Abhinav Bindra all have showed the world that what’s the power of an individual is all about..& how an individual can make impossible to possible. Yes Sushil Kumar & Vijender Kumar despite of not having a healthy background… despite of not having great facilities or like 12,000calorie diet. They have shown that it’s ultimately hard work & struggles which matters. After 56years India had won more than 2 Olympic medals……. & Michael Phelps alone had achieved 14 Gold medals in 2 continuous Olympics (6medals in’04 & 8 this time). ANYWAY EAST OR WEST STILL INDIA IS BEST!